It’s hard to leave the things you know and love behind. We all crave security. In the First Reading Nehemiah misses his home country, but puts on a brave face until the king asks him why he is so sad, and he reveals to him his desire to return to Jerusalem from exile and rebuild. Nehemiah doesn’t want to ask, because he knows the exile is God’s will, but the Lord puts it in the king’s heart to perceive that something is wrong and indicate that his will is now for Nehemiah to return to Jerusalem and rebuild. The time of exile is over. In today’s Gospel there are disciples who want to help Our Lord, but without sacrificing a place to call home and being with their loved ones. He makes them choose. They won’t forget what or who they’ve left behind; it’s the very act of leaving someone or something behind that makes their discipleship fruitful. It would be cruel if it were not for a greater good, not only for them, but for those they love. Everyone has a place in the Kingdom of God that awaits them, but not everyone can reach it alone. We wouldn’t rest until our families and friends could achieve it, but that shouldn’t limit us to just seeking it for them. Therefore Our Lord calls us to help the friendless as well. Our Lord knows the best way to help those we love. Let’s ask him today to show us, even if it implies sacrifice. Readings: Nehemiah 2:1–8; Psalm 137:1–6; Luke 9:57–62. Today we celebrate some angels who are actually pretty low on the celestial hierarchy, but have been special emissaries for God and for us. St. Michael was charged with driving out Lucifer and the angels who rebelled against God, and continues to defend the Church against the Devil. St. Gabriel was the privileged messenger who brought to Zechariah and to Mary the news of the incredible vocations they and their children would have. St. Raphael brought help and healing to the afflicted. 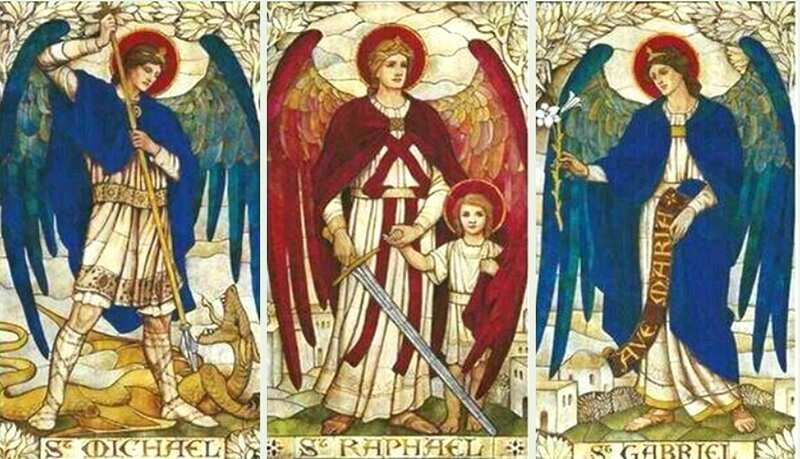 These archangels remind us that the heavenly hosts serve the Lord by protecting his creation, especially us, from evil; by bearing special witness to him when needed; and by being the instruments through which we receive healing from God. If we could see the angels who, faithful to God, carry our their missions for the good of creation, we’d be as awestruck as Nathanael in today’s Gospel at the sight of their number and majesty. The angels continue to help us even today. Let’s not be shy about asking for their intercession. Readings: Daniel 7:9–10, 13–14; Psalm 138:1–5; John 1:47–51. In the second part of today’s Gospel Our Lord reminds us that God’s designs are mysterious, but always for the good. The disciples catch someone invoking Christ’s name to cast out demons who is not currently in the company of the disciples. Yet God blesses that someone because anyone who is for God is for God’s followers. Even today among Christians there exist sad divisions that prevent us from living a full and visible communion, but Our Lord blesses everyone who believes in him to some degree and enables him to do good. The important thing is to praise the good being done and pray for the greater good: full and visible Christian unity. Let’s thank Our Lord today for all the good he does through all believers who identify themselves as Christian, and let’s pray for the restoration of full visible unity between all Christ’s followers. Readings: Zechariah 8:1–8; Psalm 102:16–23, 29; Luke 9:46–50. See also 25th Sunday in Ordinary Time, Cycle B and 19th Week in Ordinary Time, Tuesday. In today’s Gospel Our Lord teaches us about the power of charity and the gravity of sin. Just as the Lord poured out his Spirit abundantly on the elders in today’s First Reading, so he wants to pour out a Spirit of charity on all believers. Something as simple as offering a cup of water in acknowledgement of Christ is pleasing and powerful in his eyes. This should re-dimension the power of charity in our lives. It doesn’t mean being minimalist–just sticking with a refreshments table–but being generous, aware of the power of charity on a greater scale to move hardened hearts, jaded cultures, and cynical societies. Our Lord also warns us about the gravity of sin. St. James in the Second Reading warns those who’ve profited at the expense of others that any gain at the expense of charity is the deepest loss for them. Our Lord also warns those who turn someone else from the path of charity to the path of sin: sin puts a spiritual millstone around our necks that one day will drown us in our bankrupt lifestyle unless we seek his help to to liberate us. When we find ourselves in a situation of spiritual life and death a radical response is necessary to survive: if may feel like we’re hacking away a part of ourselves, but in that moment that piece of us to which we’re attached could cost us our spiritual life because we want to hang onto it at the expense of the rest of us. Let’s ask Our Lord today to help us make a radical response in the face of our sins and return to the path of charity in order to unleash its power for others. Readings: Numbers 11:25–29; Psalm 19:8, 10, 12–14; James 5:1–6; Mark 9:38–43, 45, 47–48. If its meaning is hidden there is only one way out of their dilemma: to ask him. They’re too afraid. If they’re afraid they do know that something big is going on, something beyond their control and apparently beyond the Christ’s control, so they opt for denial. In the end it’ll make the truth even more shocking when it is revealed. Our Lord asked them to pay attention; obviously he wanted them to understand, but between God’s revelation and man’s weak response the connection was not established. If we perceive in our hearts that Our Lord has something big to share with us, let’s not be afraid to ask him for understanding. The truth always sets us free. Readings: Zechariah 2:5–9, 14–15a; Jeremiah 31:10–12b, 13; Luke 9:43b–45.